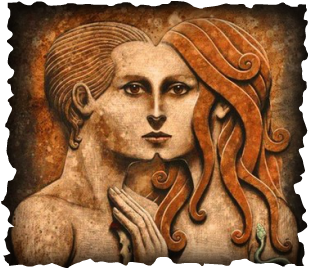 In terms of inherent polarity, a male can more easily realize his epitomized nature by developing faith through self-mastery, self-satisfaction and love toward the ideal female. Ultimately such a male can experience spiritual gnosis, the beatific vision, bhakti-rasa, etc. In terms of inherent polarity, a female can more easily realize her epitomized nature by developing faith through devotion as well as loving respect toward the ideal male. Ultimately such a female can experience spiritual gnosis, the beatific vision, bhakti-rasa, etc. Both are devoted to Truth. Both learn trust in God/NTR* above them and to be embodiments of trustworthiness. They merge, magnetically, in one accord. on the measure of our own devotion to Truth. RADA chanting/singing to reveal one's highest purpose; devotion to Truth. RADA represents the light/wisdom of Truth manifesting on earth. Invites mystic union. Key mantra chanting to promote a loving and peaceful nature; the consciousness and experience of mystic union. A male can be truly self-mastered when he surrenders to Divine grace... knowing that God above is always guiding and assisting if he serves as a Divine agent of righteousness (Maat, Agape, Christ consciousness, etc). God is in control of him, this gives him authority to handle societal control responsibly. He serves the family and society as protector, providing what is needed with exemplary moral leadership. He manifests an empowered awareness of Truth which provides the otherwise elusive peace of being "centered." A female can embody devotion when she surrenders to Divine love… feeling that God is always guiding and acting in her best interest when she serves as a Divine agent of righteousness (Maat, Agape, Mary consciousness, etc). God is in loving control of her life, realizing this gives her the compassion to nourish and care for members of family and society. Through love, creativity and high morality she manifests the inspiring sweetness of blissfully fulfilling experience. Maintain faithful surrender to God's/NTR’s loving plan for your life, through devotional practices. Trust in Divine will, aligning your will accordingly then wait for your Beloved to respond to your calling. On this path of Mystic Union, the female is devoted to the Truth which the male carries. Her devotion to her mate is full only to the degree to which that male is manifesting Truth. A woman can only surrender to a man in which she sees her own devotion reflected. If there is excessive ego, isolation consciousness, lust, immorality, lack of self-discipline and/or general immaturity a woman will not follow. Thus the importance of maintaining devotion in preparation for him so that she attracts only the ideal mate ordained for her. Women innately hold the key to male authority. She, as his partner, provides her seal of approval on his character and therefore strengthens his authority by offering her very self to the safety of his leadership... according to the Truth which resonates for them both. Similarly, a righteous male affords great value to a woman he takes as his partner. Seeing great promise and devotion in her inspires him to give his all for her well being. This path of exalted mystic union affords a natural system of "checks and balances," each partner is responsible to the other and neither exhibits self-indulgence. They are mutually surrendered to the Truth which pervades their shared life- God's/NTR's desire to enjoy the lovefull, ecstatic experience of union in creation. Read more on RADA plus poetry and prose on mystic union. N (wave): vibration; sea of existence. T (loaf or flag): Truth; that which is. Self-mastery and devotion is possible by simply tuning in to hear and abiding by the Truth... the Word of God. But clarity is only possible after we have transcended our own background noise. The static of untruth. Devi Sarani does not claim ownership of any art or photography displayed within this site. All images are used under the condition of "Fair Use" for educational purposes only.